Let's see what can BlazeDVD do for you? 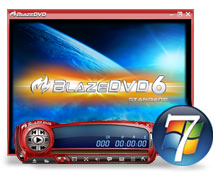 BlazeDVD can determine disc type in the DVD drive automatically and chose the right play mode for DVD titles, video CDs, audio CDs or DivX/XviD Discs. Mode let you loop playback or repeat the word and phrase you want to learn. The Professional version of BlazeDVD has all the features of BlazeDVD Standard and also supports DTS 5.1 Digital Surround Audio decoding, up to 7.1 audio channels output and playback of digital photo slideshows.